Belgian Gymnastics: Novara Cup: a bronze medal for team Belgium! This Saturday, the Belgian women's team was in Italy for the Novara Cup, an international competition that saw teams from Italy, Spain, Romania and Belgium compete against each other. And our gymnasts won a team bronze! This meet served as a final test for our WAG's team before the World Championships in Glasgow (October 23 - November 1), an important competition on the path to the Olympic Games. 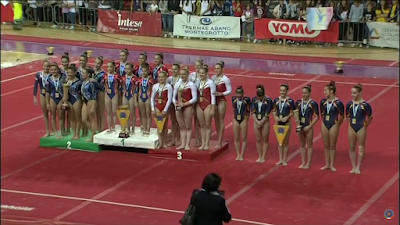 In Italy, the girls struggled on balance beam, the same event they had trouble with in Mouscon last month. Jelle Beullens (De Gympies Keerbergen ) had the difficult task of going up first for Belgium. Unfortunately, with two falls, she does not get the result she hoped to launch the Belgian team into this competition (11.000). Rune Hermans (Gym Haacht) and Gaelle Mys (OTV Nazareth) achieved good results, even if we know Gaelle can score higher (13.500 and 13.550). 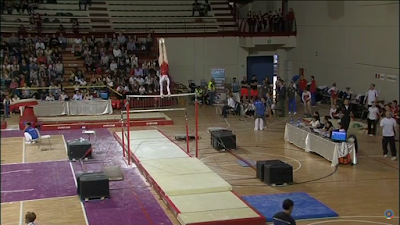 Laura Waem (Sportiva Sint-Gillis-Waas), who had only competed on uneven bars in Mouscron, competed the all around this time. If she also fell on her side somersault, no doubt that this routine will give her confidence for what's come next (12.650). Cindy Vandenhole (Vaste Vuist Lauwe) also fell on her free cartwheel (12.350). Finally, Lisa Verschueren (Sportiva Sint-Gillis- Waas) had a couple of balance checks but had a very good double piked dismount (13.350). On floor exercise, the girls impressed with their expressiveness, delivering good performances overall. Laura did a simplified exercise, with only two tumbling passes (13.250). Gaelle went out of bounds on one of her tumble passes (13,500). Lisa had the highest score on floor for team Belgium, earning 14.000. Rune, with clean landings and beautiful leaps, also earned a very good score (13,800). No major mistakes from Jelle (12.850) and Cindy (13,200). Vault, as we know, is not the apparatus where Belgium has the highest difficulty. The girls all made ​​a simple twisting Yurchenko. Laura, for who vault is a weakness, had the lowest score, 13.600. Lisa and Cindy had the best results (13 950). 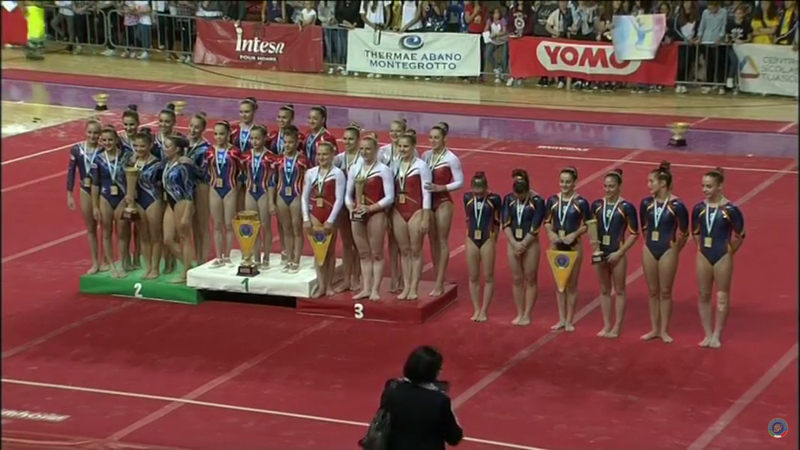 The Belgian women's team ended its competition with beautiful bars routines! 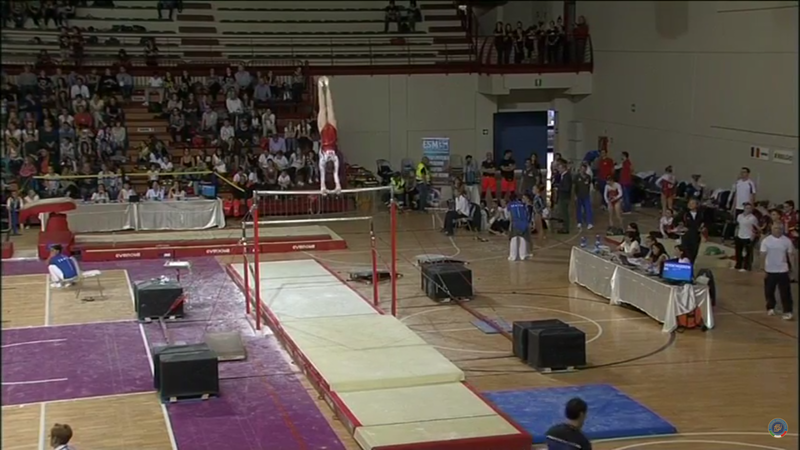 Gaelle Mys had a clean exercise, to begin this rotation (13.150). Rune Hermans and Lisa Verschueren then performed beautiful routines to earn 13.350 and 13.750 respectively. But it is Laura Waem who realized the best performance and got the highest score for the Belgian team with 14.450. Belgium scored 218.550 in total to win the bronze medal. That is 7 points higher than during the friendly meet held in Mouscron and 4 more than at last year's Worlds, in 2014. And that total can be improved, as the girls had mistakes on beam! In the all around, Lisa Verschueren is the first Belgian (6th, with 54.950), followed by Rune Hermans (10th, with 54.450).